Life is a piece of paper ripped from a page of a book. Each page contains the important most lessons we have learned as we live every day. We are easily moved by the way things capture our attentions. We tend to relate different chapters of our lives on the things that we always hear from some sayings and quotations. "Sa tamang panahon...". Seems familiar isn't it? We always add these phrases to the things we wanted to speak out and says we need to find the right time for we believe in that. 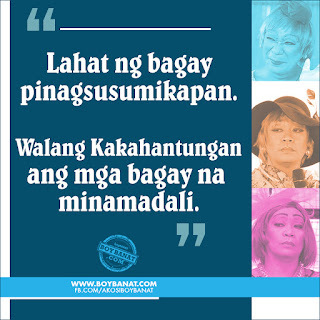 Here are some of the Love quotations and messages by the famous Lola Nidora portrayed by Wally Bayola from a segment of the noontime show of GMA7 Eat Bulaga's "Kalyeserye". "Lahat may karapatan magmahal, Lahat may dahilan"
"Walang kakahantungan ang mga bagay na minamadali. Fansign lang, love na? Text-text lang, kayo na? Ano'to?" lahat bagay nasa tamang panahon." ng iyong konsensya dahil sa pagsira mo ng iyong Pamilya." Walang Kakahantungan ang mga bagay na minamadali." Truly there are things to remember and things to forget. As they call it the "real-talk", its the reality people! Sometimes, we need to accept the truth and value it . Lola Nidora's messages have taught us that we need not to rush things, the right time will always come. And when that "right" time comes, you'll truly never regret. 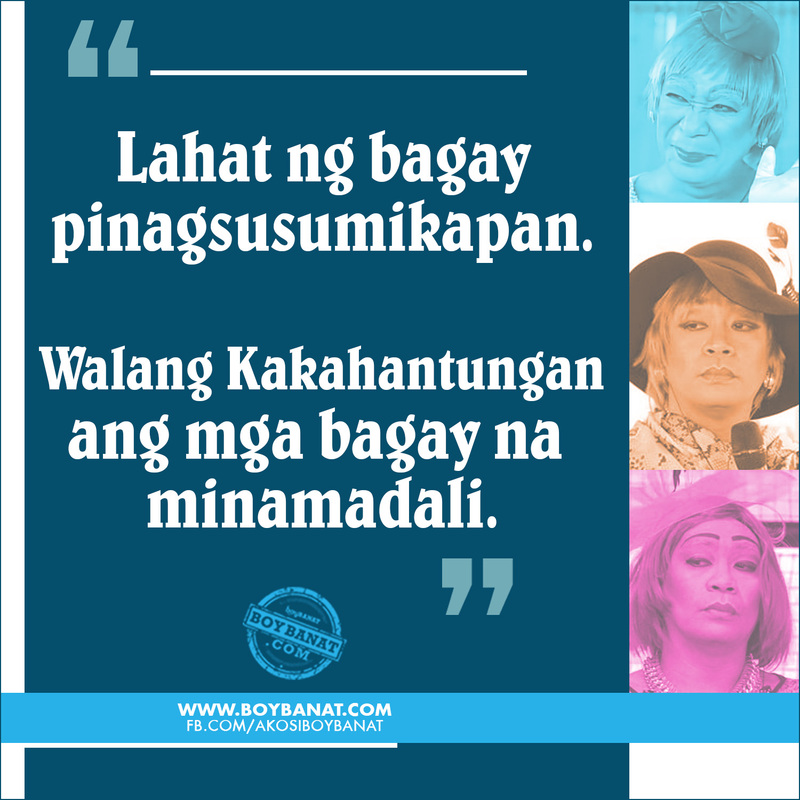 Visit us again at www.boybanat.com and Boy Banat Facebook page (www.fb.com/akosiboybanat) for the latest quotes, pickup lines and tagalog jokes.